ElkNut Forum Meatpole - 2013! OK folks, here's the Thread to put those success Photos & Stories in! Please feel free to post your photos & remember you need to "Size" photos to 800 pixels or less so they'll show up & not be denied! We all look forward to this part of the year! Thanks. 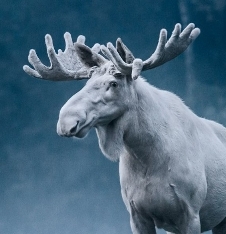 NOT an Elk . . . . I'm trying though. No time to range him as he and some other bucks were trotting by. I guessed 40 and squeezed. Arrow hit solid but it was high. I felt really good about my pin placement so maybe it was the steep downward angle. Ranged distance was 39 yards. He went about 150 yards and fell over dead just out of sight. 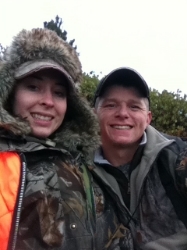 Since I didn't see him go down, my hunting buddy (who doesn't even bowhunt) helped me trail him. As the hit was high, there was only blood for the first 50 yards. Then we were following footprints and finding a drop about every 30 yards. Took an hour and 30 minutes to follow the blood trail as we kept wandering off on different tracks. Somewhat frustrating, but I KNEW he was dead so we had high hopes and a lot of determination. Cut my first weekend of chasing elk short as I shot this deer 20 minutes after daylight on opening morning. Collectively 34 hours in 4 days on stand. Finally this big guy ran in for a shot at 26 feet. Just before he came in I had a herd of cows and a spike bull come in within 30 yards but the timber was so think I didn't get any shot opportunities. I drew back on one of the cows first but she never walked clear of the tree, then I drew back on the spike bull but again he stayed tucked away, then 15 minutes later this big guy runs in. Double lung shot, ran 80 yards and piled up, 12 hours from shot till the final load of meat made it to the truck. 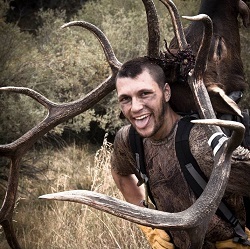 A big THANK YOU to Swede for writing his book and so freely sharing his knowledge of how to hunt elk from a treestand. I put to work all of his strategies and it was textbook perfect. Way to start the meatpole off with a big bang guys! Great archery buck LckyTylr and a horse of a tree stand bull Stringunner. Great animals guys. How much you figure you're bull weighs? He looks huge. Got this guy Sunday morning. Kyrob- his body was huge. Do know but we guessed 900+ on the hoof. He was everybit as big as my 1000 lb horse. Way to go guys, you all did awesome!! Very nice photos! Nice work fellas! 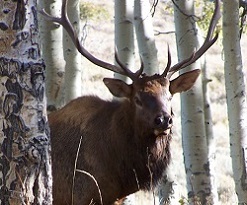 Good looking elk! Way to go guys, getting me pumped up. Boss is fireing me tomorrow, so I get to leave a day earlier than planned. We took this bull opening day in CO. Got into a few bulls in the morning and it was my turn to hang back. We made a hellacious stalk on this bull and my hunting partner made a phenomenal shot to seal the deal! What an experience... won't forget this hunt as long as I live! heres a link to the story. Congrats to everyone. Looks like the season is starting off right. Heading back up tomorrow until the end of Sept. 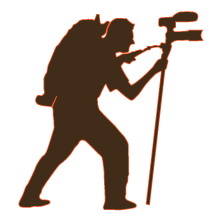 Filming America's Hunters, One at a Time. Congrats to everyone those are some unbelievable bulls! Hope to post up with my first elk soon! Sweet bulls guys......I leave in a week.........I'm itching. I shot a cow and called in and could have killed two small 5 points. Pressure was bad but I got on the board. 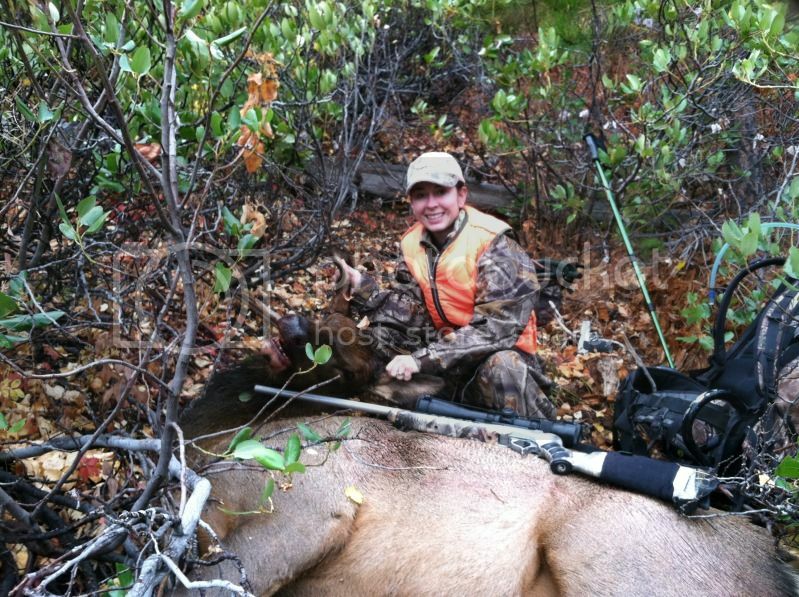 My nephew Josh with his opening day 5X5. This bull came in screaming after my brother was able to pull his cows away with some cow talk and a bugle. 40 yard broadside shot sealed it! Great start guys! That's a great pic also Bill and a big congrats to Josh on his first Bull. Well done! Thanks Dave! 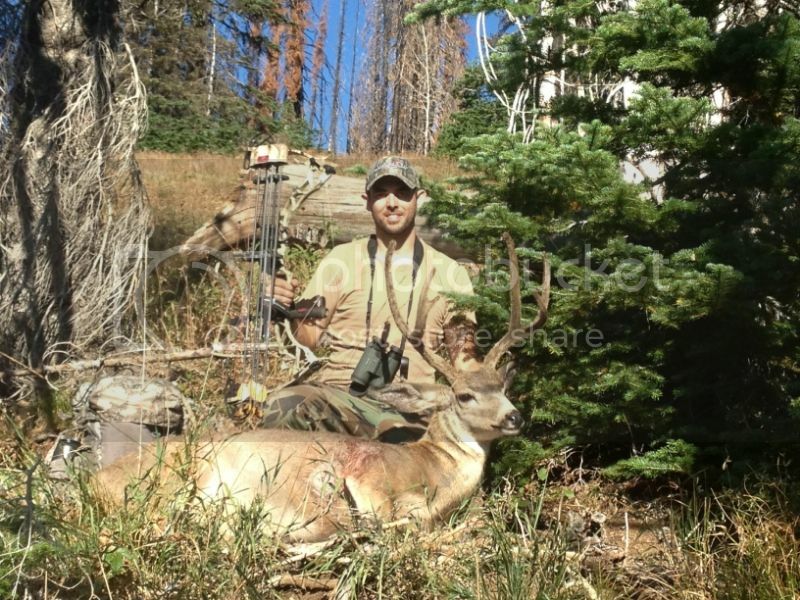 Josh had been coming close the last few years - glad he was finally able to seal the deal - and on a nice bull to boot! Hanging weight on that sucker was almost 400! Way to go Josh, success is sweet!!! Looks like a lung shot with the blood coming out of the bulls mouth! 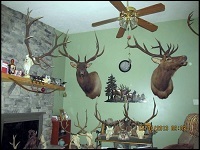 Day after opener (9/4), 5x6, non-typical with a crazy, a-symmetrical rack! It also sits crooked on his head. 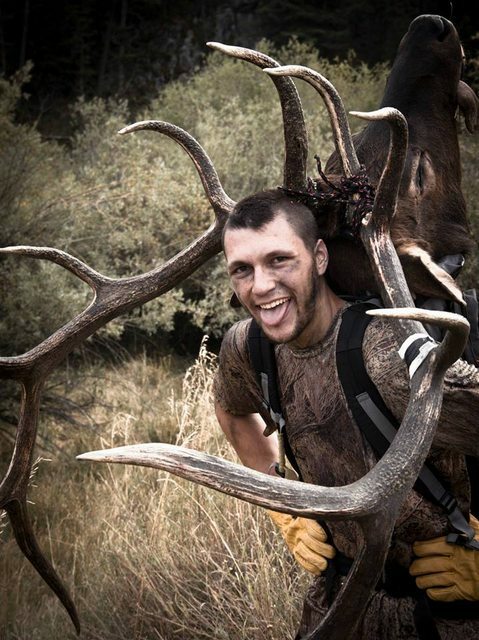 I love antlers with character, even more than size, and I think this one is pretty awesome. He should have been a 6x6, but you can see his second on the left never fully deveoped. Just a nub. These guys and gals are not vocal right now. I did some location bugling at night . . . not a peep. So I stayed in total stealth mode, 24 feet up in my stand. He came in quiet and quick, meandering down the trail at 2:16pm. I had been back in my stand from lunch break for only 40 minutes; looking over a map and texting the girlfriend, telling her how bored I was and how my back was killing me from sitting. I heard a crunch that sounded like it came from my left, so I focused my attention there for a minute. I look back to my right and here comes 'ol Bullwinkle (I stole your saying RJ ) in all his crooked glory right out from the understory! Completely startled, I gasped, realizing my bow was on its hanger and had a map in my other hand! In one motion - the map went into my pocket with my right hand, while my left hand pulled my bow off the hanger. Somehow magically, I was able to pull off both things in total silence. I took the biggest, deepest breath I've ever taken while I drew back, aimed and put one in him. Then I began shaking uncontrollably. He spun around and ran back up the trail, cut right and ran 60 yards through a wall of Devil's Club and other gnarley vegetation. He had dropped and expired a total of 80-ish yards away in what looks to be his bedding area. And it was a Hell Hole. Foot-deep, super-sticky mud, with hundreds of relentless mosquitoes and crazy, thorny understory all the way there. I only gave him a half-hour before I dropped out of my treestand and followed his blood trail - flagging my way there. He had expired by the time I arrived. The new treestand tactic worked WAY better than the blind for this area! I knew I should have employed this 3 years ago when I first thought about it. 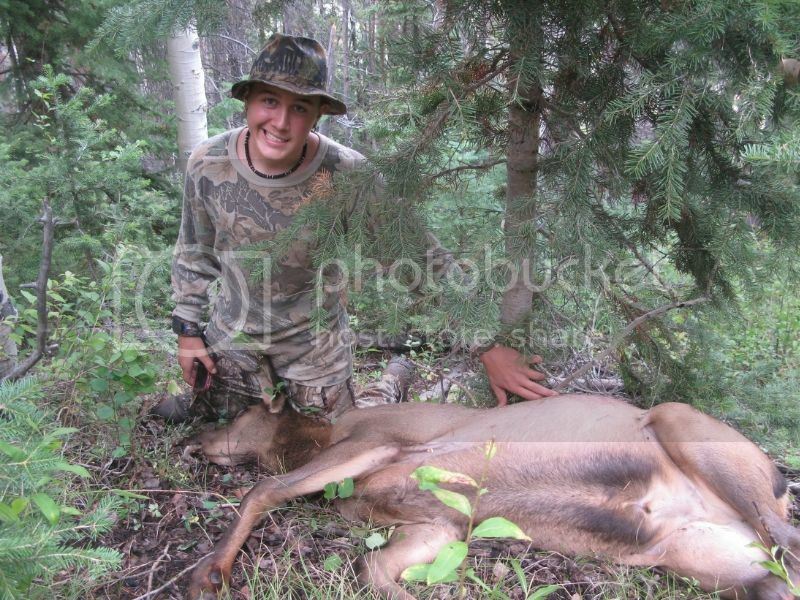 This is my first elk! Y'all had a part in making this happen I feel, and I would like to say thank you to all of you for your tips and expertise. I'd like to thank Swede for his fine book. Thank you Paul for providing such a great platform for sharing and then some. Thank you to my brother, who wasn't there yet, but zipped down and hiked all the way in and stayed LATE to help me break this thing down. Even though, he had to work early the next day. I cannot even tell you how ecstatic I am . . . SO many close calls and "should have been kills," and this year it all finally came together. Second day of the season no less. 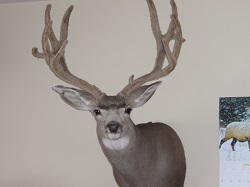 What a great start to the year so far and next week is Okanogan mule deer! 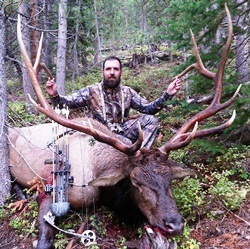 Shawn, great bull & great story, way to get it done! Thanks to you too for being a part of the Forum! Let us know how he eats! Thank you Paul! I will let ya know! I stuck this guy at 12 yards from my treestand, made a few cow calls and a bull behind me groaned then silent, i let out a high pitched 2 note bugle and the bull bugled back and then another bull bugled infront of me. Was silent for a few minutes so I through out a few more cow calls and the bull infront bugled back from alot closer so I put the calls away and waited. I could hear the bull crashing through the bush towards my location, he popped out of the brush at 20 yards and bugled and chuckled and started to come in right to me. I drew and let my arrow fly at 12 yards and he ran off about 30 yards and I could hear him crash! I'm not a big poster on the forums but I am a reader and would like to thank the guys on here for sharing all their tips and tricks! Nice job Maverick! Sounds like an action packed hunt! I guess you got your Tapatalk working. Great job so far everyone, can't wait to see some more! Nice job gentlemen! 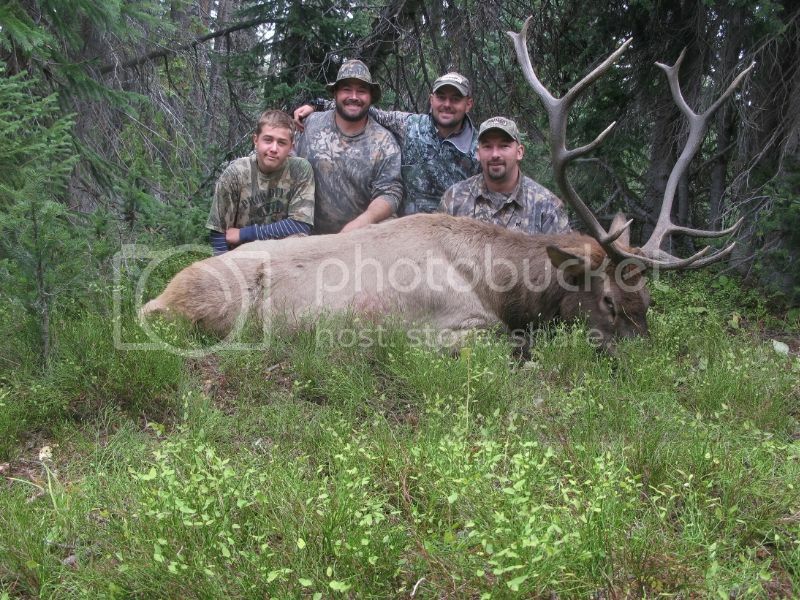 Some great hunts and some very nice elk taken. Congrats. A few real pigs harvested. 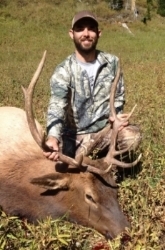 Trophyhill's 2013, Colorado OTC bull taken 4 SEP. He sent pic and asked me to post. He's still out calling them in for other hunters ..
LOL Yep . . . I was just sitting there waiting for my little ant friend to come along so I could ride him out, along with my meat and antlers. Thanks Brad! 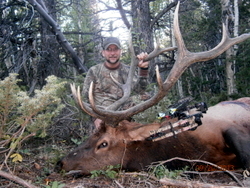 Phantom16 wrote: Trophyhill's 2013, Colorado OTC bull taken 4 SEP. He's sent pic and asked me to post. He's still out calling them in for other hunters ..
thanks Rory. just got home to butcher and freeze the fruits of my labor. heading back out with an antlerless tag as soon as I get rested up a bit. my goal is to not have to buy any beef this year. Nice work guys, great looking trophies there! 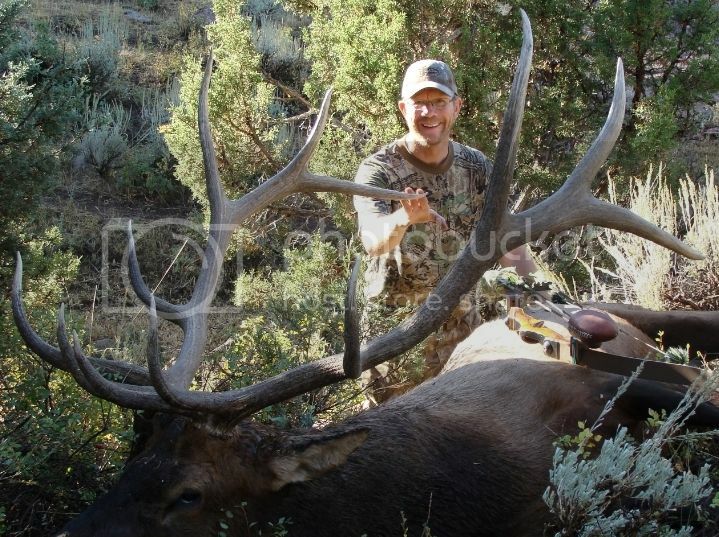 Here's JoeH2o's 5X6 Idaho Bull! Solo hunt! Some serious beasts! Great job guys, good stuff, good stuff . . .
got a fine meatpole going here. congrats to all of the successful hunters so far. Both very nice bulls! 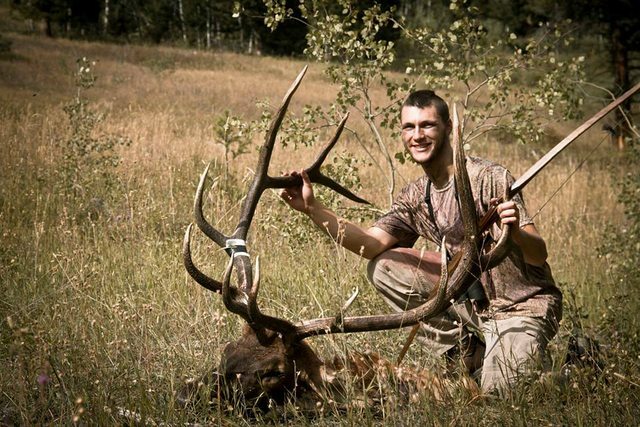 Don't apologize for antler length or structure - you can't eat those anyway - and I'm sure that both those bulls are trophies for you so be proud of your accomplishment! I love this thread. 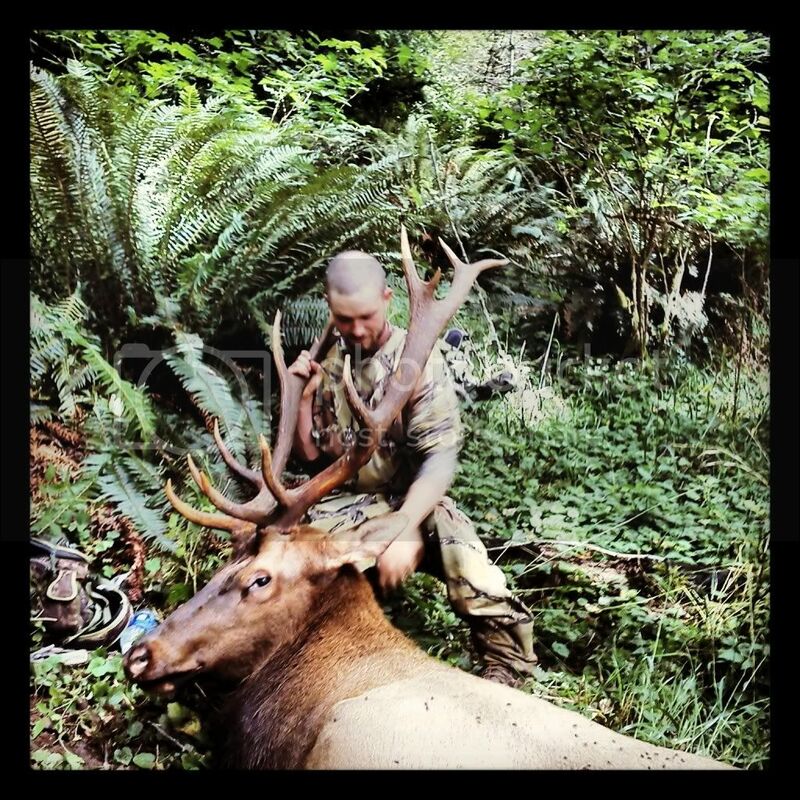 So awesome to see guys taste success and enjoy themselves in the elk woods. Hopefully I get out for another day trip next Saturday. Good Luck to the rest of ya. I shot a big 6x6 this weekend, for my first kill with a bow (a longbow no less). I don't have pictures to put up yet, but should have them soon! Excellent job folks! Congrats to all! 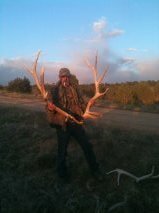 I hunted a 4 point or better OTC unit in CO. and could only manage to call in Spikes Oh well only 350 days til next season!! 9/15 was good to me! Me and Josh (MTLongdraw) made into a new spot yesterday morning. He bugled this lone bull into me for a 10 yard shot and 50 yard recovery. Couldn't be happier! Here is my 6x6 from Saturday, with another couple photos now! Man, I couldn't be happier for all of you guys! Great looking bulls! I hope there will be many more pics posted here in the next little bit. Ya baby, great stuff guys!!!! Thanks a ton for posting your photos! Here's one from my son on his Sunday Bull! (BowElkDwn) It was a rainy morning with little calling but we made it work! Paul Sr and Paul Jr. make a lethal combination! 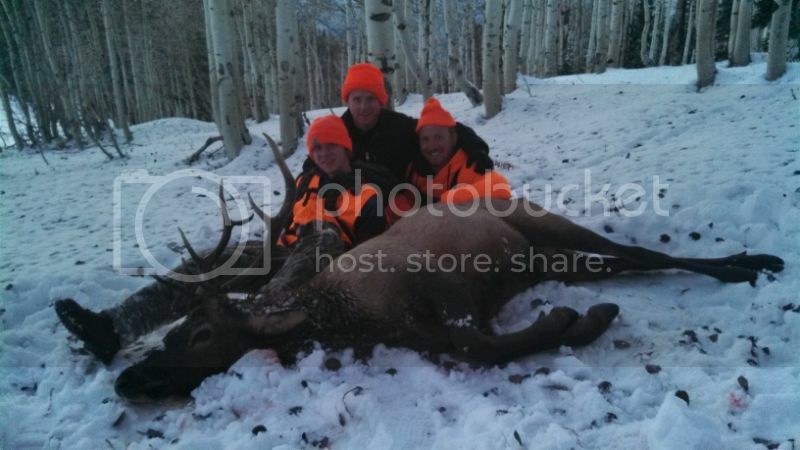 Glad the Elknut Crew killed another one! Well I have been home for a few days now but am just getting to post my report. We had a tornado go through town while I was out hunting so I had some work to do when I got home. But our trip out west was the best hunt we have ever had. We went 4 for 5 and where really close to filling out. I have mixed emotions about mine though I shot a nice 5/5 and never found him. Looked for two days and no luck. This was the first elk I never found. Bummed me out for a couple of days but I got back in the swing of things and was able to shoot a cow so I'm happy to bring some meat home. We wound up with a 4/4 and 3 cows. I cant wait to head back up real soon! Thanks Brad have not got through all of your report but it looks like you have had allot of action so far. My first elk hunt. I ain't an elk virgin anymore! Way to go Broken arrow! Congrats! I'll ask cnelk to post up my pic since I'm too challenged to figure out how to shrink the resolution to wherever this forum allows posting! Thanks eriks. 12% success rate and my first time elk hunting I feel like I beat the odds! Broken Arrow, great job dude!! Thanks for posting the photo, a hunter would do well to tag a cow every year, I hope your streak continues bud! Thanks for posting that photo, Brad. You got all the good parts! Thanks, too, Paul, for the nice email. Bad conditions, good outcome. Not always what we expect it it to be but we adapt, right? Forgot to mention this was a CO DIY public land bull in a LE unit. Great pics guys, keep em coming! Nice elk guys. Glad to see the traditional guys getting in on the action. It's been years since I shot a recurve but have been thinking about getting back into it. 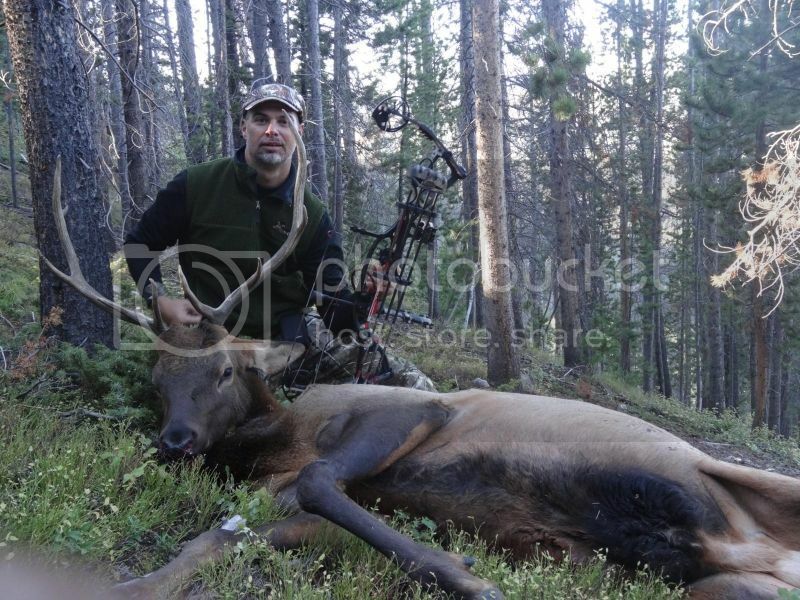 First elk, first archery animal, second year of archery hunting. 40 yard shot, 100 yard recovery. 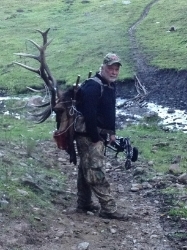 1 Huge lesson in packing elk on my back. Nice bull Neitz. I like that sticker on the side. 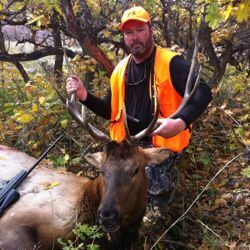 Broken arrow wrote: My first elk hunt. I ain't an elk virgin anymore! Congrats Broken Arrow, I'm always amazed at how beautiful cow elk are once you get up close to one. We just got home from 6 days in the high country. Definitly one of the the wettest year I've experienced, but it did finally dry out a little by mid week.We did'nt see the numbers we have in past years, but did experience some great calling action.The first morning out we were working on a bugling 6x6 bull that did come in to about 150 yds, then hung up in a grassy wallow & put on a great show playing in the mud, but decided to head back to the herd that was going thru the timber above him.Called in a cow that my son said he could have hit on the nose with his arrow.The next evening, we pulled in a decent 5x5 to 15yds, but that blasted oak brush did'nt allow a lane to shoot thru. That bull left but we had another coming down the draw so kept calling & brought him in to the same area as the first bull, but he took a couple extra steps & my buddy Shawn (recognise this big galoot WW) lanced his first elk at 30 yds.Somewhere along the line he had picked up a spike that just stood there & watched the 5x4 go down. Great excitment that evening!The next evening we talked a cow out of the timber for a landowner that had a landowner tag for a cow for a perfect 75 yd rifle shot...which he promptly blew. Tried to take her in the neck, but evidently just came close to the vital stuff as he knocked her flat on the first shot & then waited too long to put a finishing shot in. She got her feet under her & headed for different country. We tracked her by foot prints for as far as we could & only found 1 quarter size spot of blood. Had'nt heard about the "void" in the neck. The only good thing about that evening was the fact that I really believe that cow will recover & that the landowner told us he would allow us to hunt his property next year in return for calling in & helping him look for her.The last evening was a hoot as well. That morning, we heard no bugles close in the area we had been hunting all week & only saw 1 bull in the distance as he climbed out of a wallow in the bottom of a draw to climb to timber to bed.The evening was also completly quiet. We got in pretty early in the afternoon, took a nap, ate candy bars & in general just dinked around with sporadic calls. nothing...About an hour before dark, I told the boys I was going to hike up the ridge to check for any fresh sign. I had left my Elknut chuckler tube with the boys & was only mabe 150 yds away when I heard them start playing around with the tube...& giggling.....& trying to chuckle & giggling..Heck, I was giggling. About the time I was thinking they sounded terrible, a bull answered from the timber across the draw.Well, that the ....they answered him & he cut em off. The next time he bugled he was alot closer & they cut him off. That bull was fired up!I turned & tried my best to get back to them but could'nt get there before he trotted out of the timber at 150 yds.I just sat back & watched as he header right for them.My concern was that we had butchered Shawns bull almost directly in line with the bulls travel direction. He disapeared behind a little rise & the next thing we saw was him heading out. I believe he picked up on our scent around that carcas & decided there would be a better day.He was a beautiful 5x5 & just a little to smart.When I got back to the boys , they were both close to cardiac arrest. What a way to end the hunt. Here's a couple pics. OTC DIY Public Land Washington. We went 2-3 for our camp, one 7x6 and one 5x5. Was a good year. Thanks ElkNut! We are very gratefull! After 3 or 4 years of learning how to call and listening to Elknuts CDs I finally tried calling and the first time I did this big boy came marching in to 35 yards. Why didn't I have the confidence to try this before? The next day I called in 2 more for my brother in law. 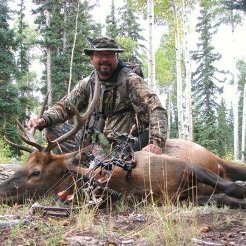 I think this experience changed my whole outlook on elk hunting! I heard thru thru the grapevine (actually from the horses mouth) that Elknut's apprentice killed a bull in Montana and working on getting his partner 1. Since I tagged my elk early, it was time for archery moose in saskatchewan. First morning out, cow called a few times over 20 minutes, then hear a faint woof woof. I did a few short cow moans and could hear louder woof woof. Got in position for a shot and he stepped into the clear at 13 yards! He'll be a good eater! Congratulations to all of you successful hunters. 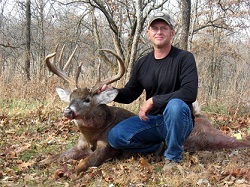 I hunted 29 consecutive days, mornings, afternoons and evenings with only a one antlered buck to show for my efforts. There was never an opportunity for a good bull, but that too is hunting. I passed on a couple cows and an iffy chance at a spike early in the hunt, and then missed one during the last week. 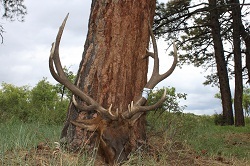 My arrow hit a small dry limb and stuck in a tree 15 yards to the right of the cow elk. I could hardly believe my eyes when I finally saw the arrow. Ouch! I did get to see Stringunner packing out his elk head. I was very near when he shot it, but never had a clue. I am still very green with envy. Anyway congratulations all. Don't feel bad Swede! I haven't even been out yet. But I have until January 15 to hunt. Right now I have to wait until we get the freezer worked down enough to hold an elk. Just before the season my wife found a sale on Popcycles and bought 30 boxes. (no joke)! That filled the freezer. Hey Buglemaster: Tell Shawn congratulations. You don't need a horse with him around. You might mentions to him that the Broncos are looking for a good backup left tackle. LOL! Have you found us a good place to hunt piggys yet? WW: Thanks buddy for the kind words. To be honest, it hurts to fail. I know it is a character flaw of mine, but the feelings are all still all there. I hunted long and hard, putting in about 275 hours in a stand, plus time on the ground, I gave it my best, but it was just not to be. Hunting that long and hard, with just one average buck to show for it, is a new experience for me. I am already plotting against those miserable elk for next year. P.S. Congrats on the nice bull bnsafe. Way to go bnsafe! Congratulations are in order. Connected on this guy a few days after I shot my bull. 23 yard frontal shot. So steep, after he ran about 30 yards and fell over, he rolled down the hill 125 yards to the bottom. Welcome back Swede! I'm really sorry to hear all your hard work didn't pay off like you had hoped. When you put in THAT much work, you expect the big pay-off. I would at least like you to know how much your book helped me hone my hunting strategy, and wrangle-in all the loose pieces of information and half-ideas floating around in my head - enough to finally put an elk on the ground. There were some things I was definitely doing right, but some I was definitely doing wrong. Without it, it may have been another season or two of tag soup to finally get it right. You would think for someone who has worked in the wildlife field for 15 years as a tech/biologist/environmental specialist and even worked on a trophy hunting ranch, I'd be able to "Git 'r done" alot sooner. Yet, you, Paul, and the others are who helped me achieve success. Now my challenge is consistency. If it makes you feel any better, after 3 or 4 hours of my brother and I tracking a very miniscule bloodtrail that zig-zagged all over a mile radius - I lost the nice mule deer doe that I shot last week. From the ground at 26 yards the hit looked really good. I REALLY hate to admit that, but it happened. Never thought it would. Two days later my would-be filled bear tag was blown by a road hunter. Last week was filled with very high, highs and lowest of lows. Maybe you can hit it during the late season? I can't remember if Oregon's seasons are split like Washington. Bnsafe, from one first timer to another CONGRATS! Guess I'm gonna have to learn to post pics from my phone cuz I killed an otc, public land monster on the 13th here in Colorado! Congrats to all successful hunters! Shot my first elk on the second day of my first elk hunt. 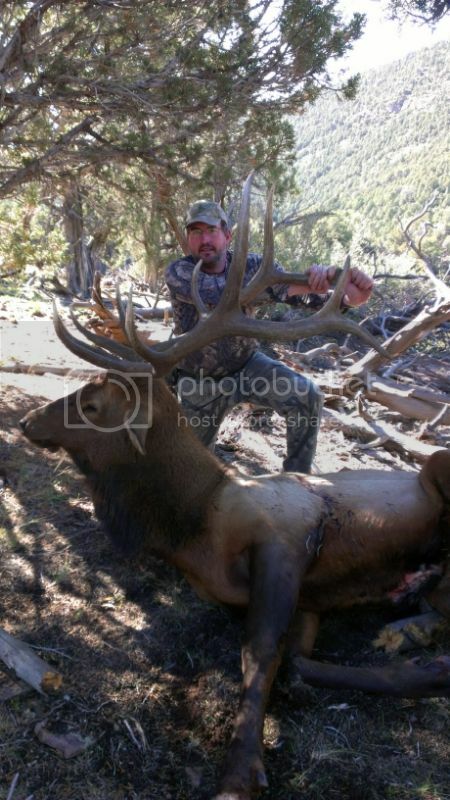 On the 12th afternoon of my AZ archery bull hunt my helpers pulled this bull into a shooting lane. With the season winding down and no meat in the freezer the green light went on. 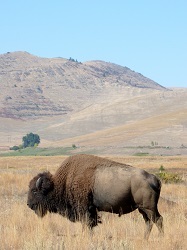 Had several encounters with big bulls and many more with small bulls, mostly with raking and bugling sequences. 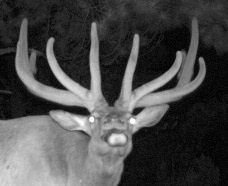 Seemed to me to be a very good rut year in central AZ. Wow congrats to all, just getting back to cell service looking forward to reading all the stories. 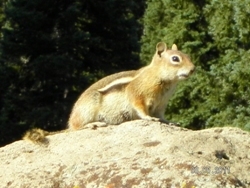 Here is a pic of mine, I called him off of private property using a Lil Chuckler. I am happy!!! Congratulations everyone. Especially, you first timers. Thank you all for sharing your detailed stories whether you were successful or not. They are huge help to us all. Thank you mtnmutt! You had all your ducks in a row, had a great workable plan and I was really rooting for you. Do you have anymore time left in your season? You WILL be successful! It seems like this terrible weather screwed a lot of people. My elk week and deer week both sucked most of the time. A couple of nice days, but I can't tell you how many times I swore I was gonna get struck by lightning, and watching those ominous fronts move in wilted my mood on many days. 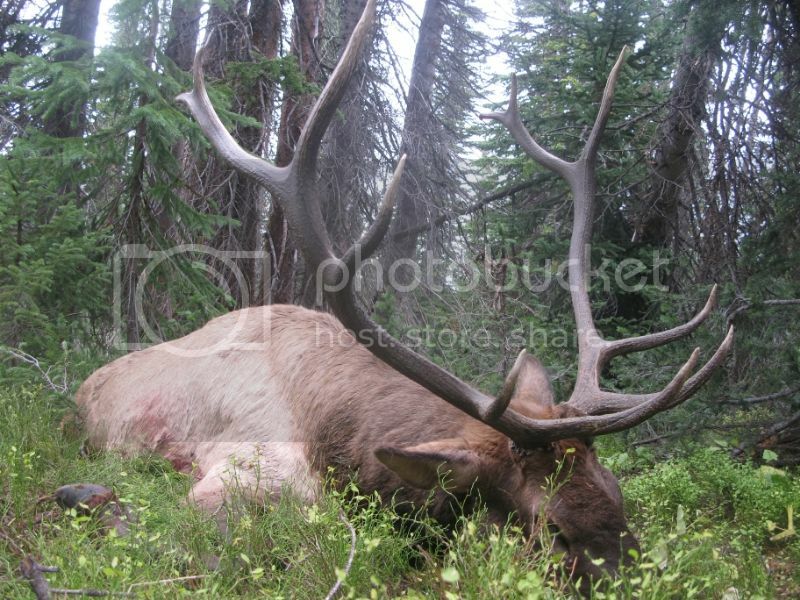 Its not over yet, but finding the elk has puzzled us all these last 2 weeks. The hunting pressure was unreal this year. I hunted during the flooding weekend, 2 weeks ago. There were hardly any hunters so I thought things would be good and they were terrible. I don't think the elk moved around much during those multiple high rain days. I met a ton of great people this season out there. Lots of good lessons learned and one more day to get it done. Patricia... buy a Wyoming point. Today is the last day. You need to kill one! First Ever Elk! Colorado, OTC, DIY, Solo at the time of the 8 yard shot, not solo for the pack out. Spent 18 days in the woods this archery season. Was on elk every day but three. We put two on the ground lost one and managed to watch a 350 class bull come two yards from my son but bust out when it heard my son draw his bow. In my son's defense it was his first year with a bow. Some lessons are hard to learn... All of our hunting was OTC on public land Colorado. I have so many stories about this year... We passed on lots of small rag horn bulls and cows it was stupid this season... 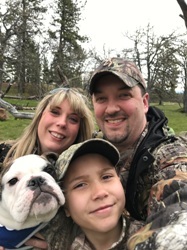 I have a 1st season rifle Bull tag and my son has a cow tag for the same unit here in 10 days and the bulls are just starting to bugle so I am planning on putting a nice bull on the ground with the bang stick. I was fortunate enough to double up with my friend Troy on 2 5x5 bulls an hour apart. Congrats to all! I was quite fortunate this year as well. Here is my Colorado otc, public land bull called in by myself to 8 yards! He went another 10 yards before piling up! and got this guy yesterday Sept. 29th in Wyo! otcWill wrote: Congrats to all! I was quite fortunate this year as well. Here is my Colorado otc, public land bull called in by myself to 8 yards! He went another 10 yards before piling up! Stud bull! A big congrats to you. 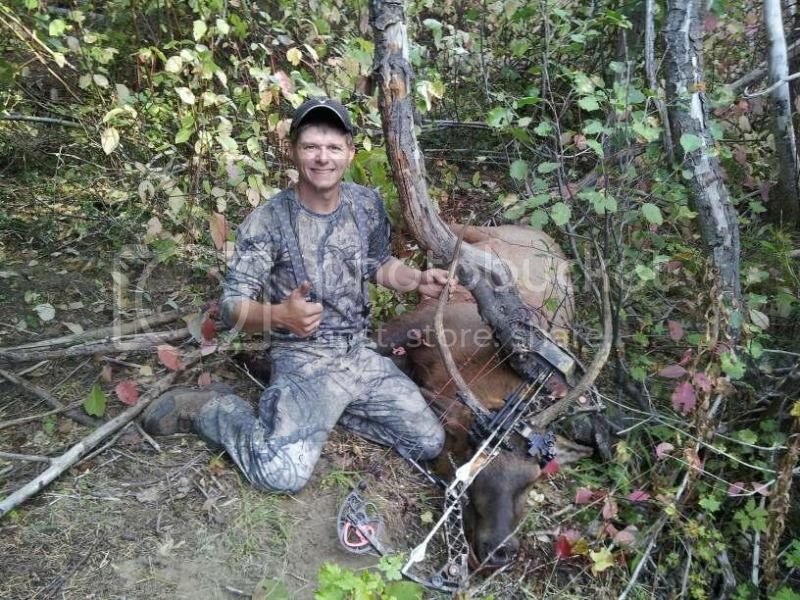 First archery bull. WOOHOO!!!! Idaho OTC, DIY. Love my Hoyt! Nice Bull. For Idaho, he's got really good Thirds. 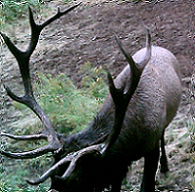 Stateline wrote: :P First archery bull. WOOHOO!!!! Idaho OTC, DIY. Love my Hoyt! Great work!!!! How'd you get him to fall right on that road...? The hunting gods smiled down on me that day! That is actually a cutout for a brand new fenceline. It pretty much served as a road though. Made the pack out easier than it should have been. Nice job everyone and good luck to those of you still going at it . DIY OTC Public Land Montana Bull. 1st attempt was a big success. Thanks to ALL of you on the forum, from the experts to the newbies! There were many questions posed and answered on the forum that were invaluable in the field! It took 12 years and a Rifle, but I got my first elk this year. 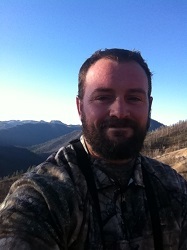 We hunted on a CO RFW property called Big Gulch north of Craig Co. Stalked in as close as we could get, single shot from the old .270. The 130gr TTSX passed through. He only went about 50 yards before piling up. I actually shot him as he started to spar with another bull. Didn't know what hit him. We probably put in 12 miles in the day and a half it took us to track him down. Only 10 months before Archery season. It's about time Dana! Congratulations!! Here is my first Elk. DIY on Public Land in the Flattops Colorado. After 13 years I kill him on Friday the 13th in September at 8:00. I still hunted in on three bulls and shot this bull. 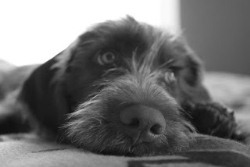 He was the smallest of the three, but was the first to present a shot and after 13 years I wasn't going to be picky. Nice going guys. Welcome to the pole. Idaho 2013 OTC public land, elk hunting day 16. Snowed 8 inches on our base camp at 7600 feet on Sept 25th. Got the bull at 9600. Thanks Elknut! Wow!!! An Idaho Monarch!!! I'd waste half a day just staring at a bull like that . . . end up doing the first pack out in the dark. Congrats, that's an amazing beast Jensen. 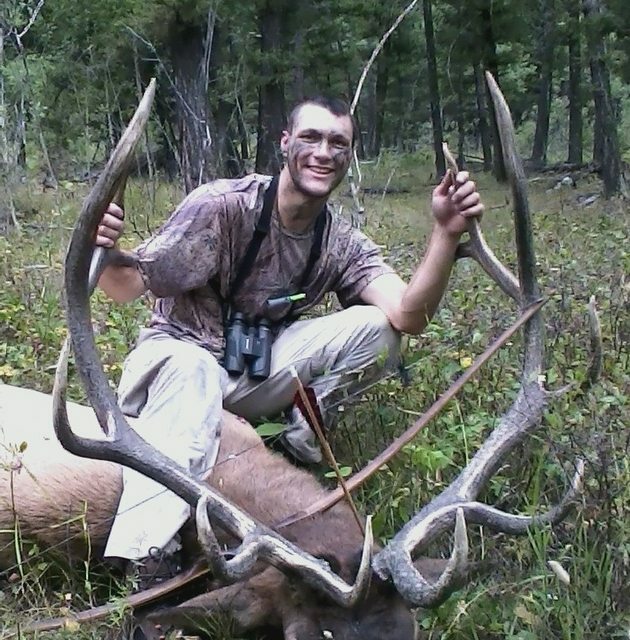 This is my 2013 Montana Public land bull. I bugled him in on October 19. 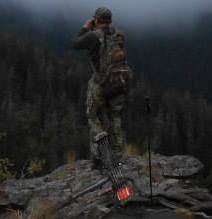 2nd to the last day of the Montana Archery season. I used our Watermelon call. Part of our Bull Whacker Pro series. He thrashed the heck out of a pine tree and came in on a string! 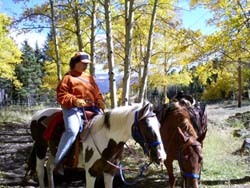 I took a cow this fall on a western slope Ranching for Wildlife Hunt. Didn't have a camera until she was quartered. Snow is great for cooling meat fast. Too bad I wasn't deer hunting. Glacier Country Hunting Calls Crew Strikes Again!! 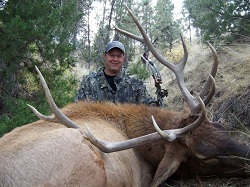 This is the Bull that I Bugled in for my wife, Deb on Opening Day of the Montana Rifle season! I used just about everything on this bull. I had called this bull in 2 weeks previous during bow season. I started with a Watermelon, switched to an Orange Enrager and a High Heel Hottie. He liked that but some other hunters drove by him, luckily didn't see or hear him in the timber. Whew!! The bull moved off however and we lost him for almost an hour. I got him to answer again with a Troys Secret Weapon and the hunt was on again. I then just stuck with the Secret Weapon because he really responded to that call. I could have called him in with any of the diaphragms though. I just tried a little bit of everything on this one for fun! 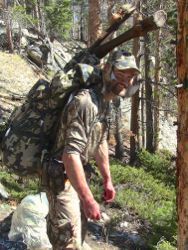 This is a Montana Public land DIY hunt. This bull has heard just about every call on the market. I know 2 weeks ago 4 different pickup loads of guys were hunting these elk! The harvest percentage in this unit is less than 5% . What a great day in Montana!! My 2013 buck. The only thing else I bagged was a tree. 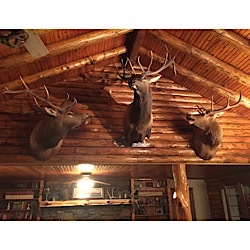 I know this is the elk forum, but there is no meat pole in the deer camp. cnelk, I could have started a tree meat pole. I made a great shot on it. Not to brag too much, but I center punched it perfectly at 40 yards. The trouble with that whole matter was the size of the tree. At only two inches in diameter, it was no trophy. It is interesting that I never noticed the buck had only one antler before I shot. As I commented before, he was laying on his side with the antler side down and his head behind a small log when I came walking upon him. At first I was in shock, thinking I may have shot a doe. Just like when my wife spotted the arrow I shot at an elk later in the season, I was in disbelief. I do not know why I did not notice he had only one antler. I will attribute it to his weaving in and around a bunch of small trees and to bad eyesight. Anyway I was relieved when I got closer and saw he did have at least one antler. Swede and cnelk- Maybe the thread could be titled "Got Wood?" I am sorry, the barn was broadside. I had to take the shot! LOL! What did you do with the meat? I ask since it looks like you are camping out. 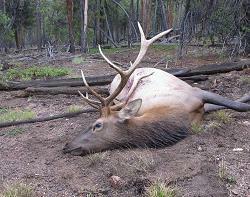 The most frustrating elk season I've had ended successfully on Saturday. It took 25 days and 193 miles of walking before it ended in a very unusual and unexpected way. This bull and a few other cows he was with were the first I had seen all rifle season. He came out about 10 minutes before dark. Nice bull mtlongdraw. Way to hang in there. There is a definite correlation between time in the field and animals taken. Thanks Swede. I wasn't sure of that, but I kept going anyways. Turns out its true and I'm just glad my health, family, and work allow me to keep at it as much as I can. 2014 season started Sunday. 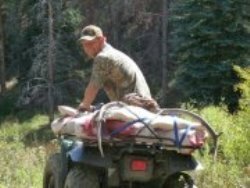 We always take our biggest coolers full of ice, we section the elk up out in hills and tie up a meat pole in the shade and wait for the horses to get there to pack it all back to camp.We then pack all of the meat in ice. Congrads to all of you!!! I know there is going to be some fine eating around some kitchen tables this next year. It looks like elk, mule deer, and moose are all on the menu. MMMMMmmmmmm Man, all these pics make me jealous of the adventures you've had and the fresh meat you've worked hard to harvest. Once again thanks for the stories and pics!!! Some great animals and stories to go with. I see I am going to be spending a lot of time here. 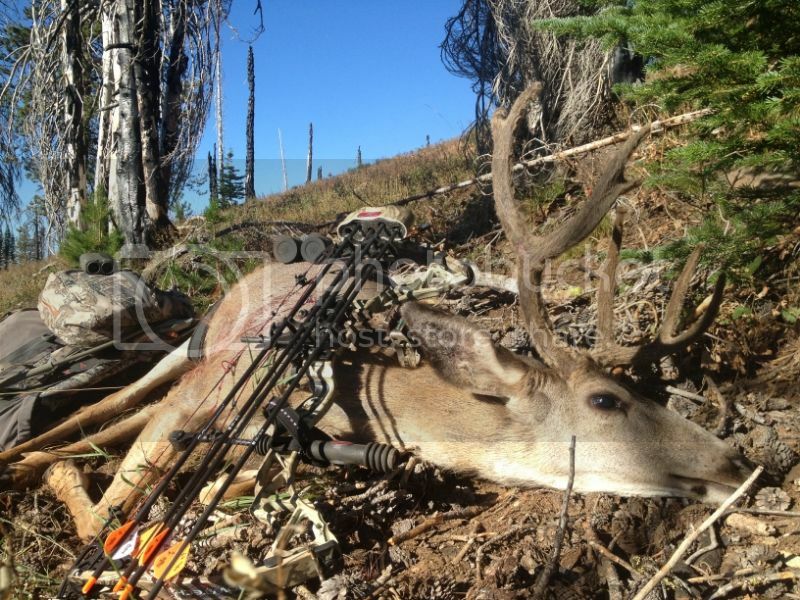 3x3 Blacktail Buck taken during the Oregon 2013 late bow season. Here are my first 2 elk i was fortunate enough to take this year. Cow i got in WY and the bull comes from ID. Great looking critters...congrats to all! Got this guy 7 by 7 Roosy opening morning 2013 bow season 1 hour hunt haha! Thanks Paul!! 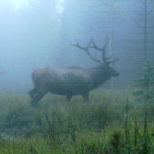 Located this bull and several others day before opening morning and this guy seemed aggressive so went back opening morning and he responded to a cow call with bugle and chuckles so I stormed in cow calling as I went. When I got to about 50 yards I let out a bugle and he responded with bugle and grunts so I let one off and he bugle and grunted again and I cut him off. I heard him coming in bugling so I moved silently toward him and set up he came right in and presented a 20 yard shot broadside. Went 40 yards layed down and expired. Thanks to you Paul and your tactics I have been able to connect and get more encounters than ever!! Thanks Elknut! Elktracker wrote: Got this guy 7 by 7 Roosy opening morning 2013 bow season 1 hour hunt haha! Thanks Paul!! Located this bull and several others day before opening morning and this guy seemed aggressive so went back opening morning and he responded to a cow call with bugle and chuckles so I stormed in cow calling as I went. When I got to about 50 yards I let out a bugle and he responded with bugle and grunts so I let one off and he bugle and grunted again and I cut him off. I heard him coming in bugling so I moved silently toward him and set up he came right in and presented a 20 yard shot broadside. Went 40 yards layed down and expired. Thanks to you Paul and your tactics I have been able to connect and get more encounters than ever!! Thanks Elknut! 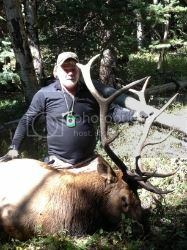 Great bull Elktracker! I hope to hunt and kill a Rosie some day. I know they present their own set of challenges hunting in "jungle' conditions. Awesome pix guys! I am already anxious about this upcoming season. This may keep me tied over. 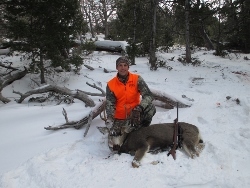 My Dads bull, shot the same trip 500 yards from mine 4 days later, there was another bull shot in between ours by the camp cook at the outfitter base camp. Sadly this was our last elk hunt together, he passed away the following year. good Job Matt. Nice pics. My buddies bull from last year. Complete pass through at 30 yrds with VAPs and 100 gr Slick Trick Mag pulling 62 lbs. 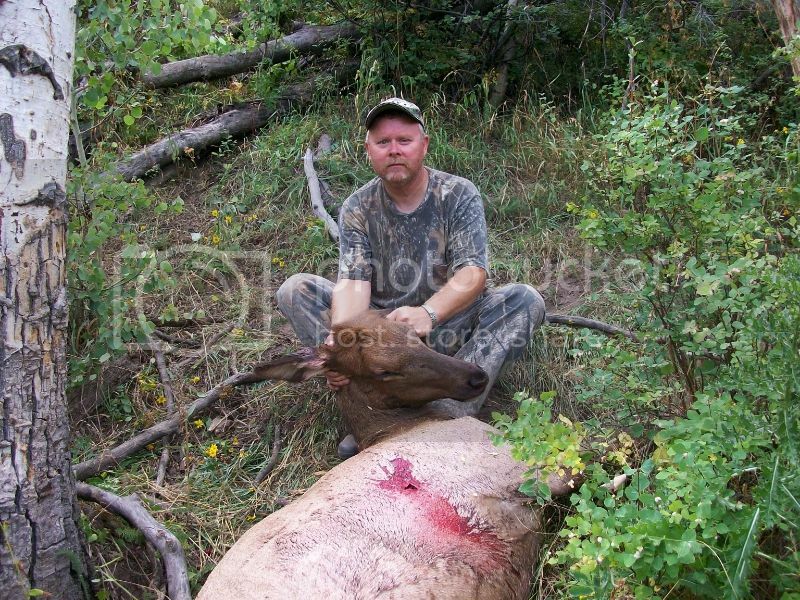 Never did find the arrow..
Had not posted a pic of my last years Co Elk. 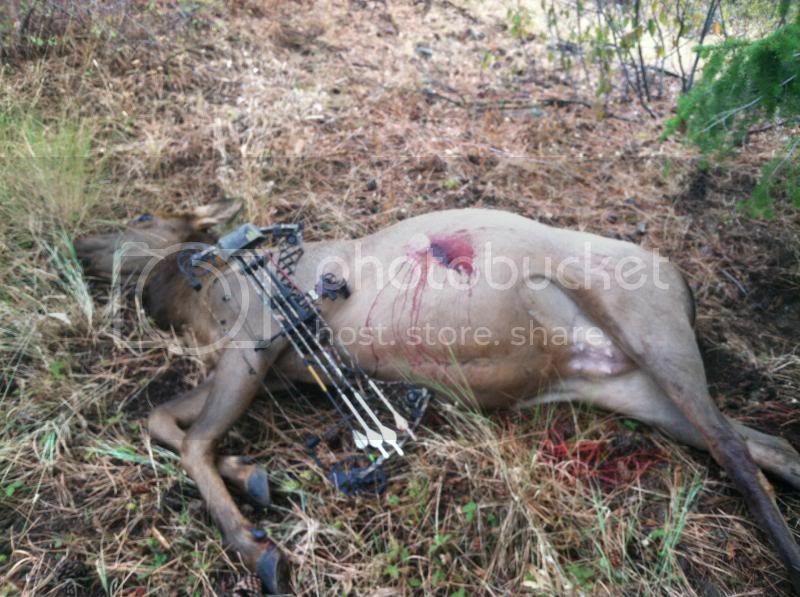 Shot with a bow at 42 yrds. Ready to do it again!!!!!!!!!!! !